Regular white rice has been milled to remove the hull, germ and most of the bran. It is available both long and short grain, the long grain being a better all-purpose rice. One cup uncooked= 3 cups cooked. Parboiled (converted) rice contains the vitamins found in brown rice but is polished like white rice. One cup uncooked=3 1/2 cups cooked. 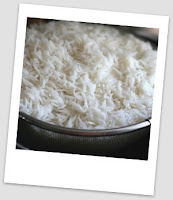 Precooked (instant) rice is commercially cooked, rinsed and dried before packaging. It is therefore quick and very easy to prepare. One cup uncooked=2 cups cooked. Brown rice is unpolished with only the outer hull removed. It has a slightly firm texture and a nutlike flavor. One cup uncooked=4 cups cooked. Wild rice is the seed of grass that grows in marshes. It is dark greenish-brown in color and has a distinctive, nutlike flavor. Expensive, it is sometimes combined with white or brown rice. One cup uncooked=3 cups cooked. Put rice in saucepan large enough to allow for two times expansion. Cover with water to about 2 inches above rice, add salt if desired. Bring to a boil and boil uncovered until most of the water is gone. Turn down heat as low as possible; cover and steam about 20 mins or until water has been absorbed. Stir in 2 TBSP margarine, melted, and 2 TBSP lemon juice into cooked rice. Heat 1 can mushrooms, drained in 2 TBS margarine until tender; stir into cooked rice. Cook 2 TBSP finely chopped onion in 2 TBSP margarine until tender; stir into cooked rice. Stir 2 TBSP fresh parsley into cooked rice. Saute’ carrots in oil about 10 minutes. Add onions. Cook 10 minutes longer. Stir in rice and salt. Cook, stirring gently until rice is heated through. Add sesame seeds; toss lightly. Melt butter in heavy skillet. Add rice; cook over medium heat, stirring constantly, until butter is absorbed. Pour in 1 cup stock; cook, stirring frequently, until stock has been absorbed. Add 1/2 cup stock; cook until absorbed. Add remaining stock; stir well. Cover; simmer until stock has been absorbed, stirring occasionally. Cooking time will be about 25 minutes after first addition of stock. (From the book The Encyclopedia of Creative Cooking). Melt butter in frying pan. Add rice and onion; cook over medium heat about 5 minutes or until golden, stirring frequently. Turn rice mixture into casserole dish. Stir in stock; cover. Bake in preheated 425 degree oven for 25 minutes, or until rice is tender and stock is absorbed. (From The Encyclopedia of Creative Cooking). Put rice into casserole dish; add water. Let stand about 3/4 hour. Add all other ingredients; mix well. Cover; cook in preheated 350 degrees oven about 1 1/2 hours, stirring occasionally. Most of liquid should be absorbed, but serve rice while still moist. Yield 4 servings. (From The Encyclopedia of Creative Cooking). Combine water, milk, salt, and uncooked rice in 3-quart saucepan; bring to boil. Stir once; cover. Turn heat very low; cook 20 minutes or until water and milk are absorbed. Do not uncover while cooking. Spoon rice into serving dishes; top each serving with 2 TBSP butter, 2 TBSP sugar, and 1/2 tsp cinnamon. Serve immediately. Yield 4 servings. Unless otherwise noted the information and recipes on rice were taken from the Betty Crocker’s Cookbook.